I've started a new project around espionage and have started shooting for a series on how most people would imagine a spy. 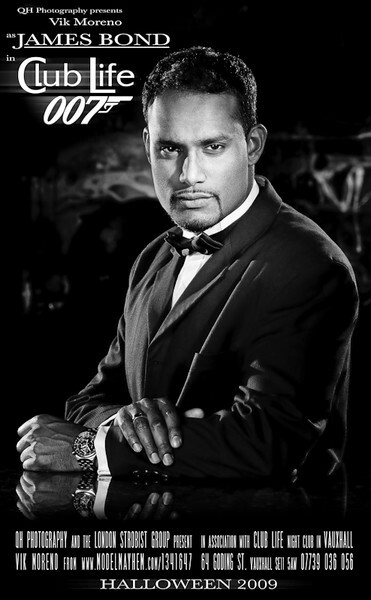 Of course the most popular spy would be James Bond 007, a fictional character created in 1953 by writer Ian Fleming. James Bond was an officer of the British Secret Intelligence Service, a handsome gentleman surrounded by his bond girls! That's how probably lot of people would imagine a spy, or maybe Jason Bourne? Halloween 2009. The London Strobist group has organized a meetup in a night club: Club Life in Vauxhall. They gathered around 15 photographers, 9 models and 3 makeup artists. The group rented out the club for half a day and had fun testing new lighting setups and sharing knowledge. That was where I met Vik Moreno and knew he would be my perfect subject for my new project on espionage!